Strife between siblings … it’s enough to weaken even the stoutest of hearts. Continual bickering and conflict is wearisome to the parents and can ruin an otherwise pleasant day. In fact, my mother, who was an only child, says she remembers arguing with her doll, you have or will have to deal with contention. Contention is a direct result of our sinful nature. I have often tried to identify the root of conflict between two of my sons. Was it the age difference between them. Were they lacking individual attention. Could it be the younger one was overly sensitive. Or maybe the older one was overbearing. As I prayed and searched for wisdom, I became aware of the root cause of strife. It is pride. Pride is an attitude of arrogance or self importance. Pride seeks its own way and is selfish. Right away a light went on for me. I no longer needed to hear who started it or who did what to whom; I could focus on the root of the problem. 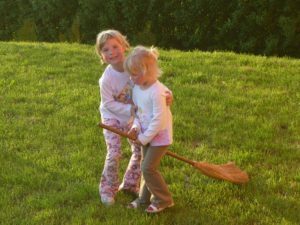 Often times when my children were bickering, I would automatically look for a way to restore peace. My first reaction was to separate the offenders. I might send them to their rooms or change their focus by giving them extra chores. This did result in an immediate focal change, but it didn’t deal with the heart of the issue. So, I found there was no lasting change of behavior. The problem was merely covered over only to resurface a little later. I became aware that God’s antidote for overcoming evil was to do good. There are many references in the book of Psalms that refer to purposely doing good to others regardless of the other person’s response. Furthermore, Jesus spoke of doing good to those who hate you and even praying for them (see Luke 6:27). Right away there was an opportunity to put godly principles into action in our family and overcome evil with good. Luke and Mark began to squabble at the breakfast table. I informed the boys that we would begin to overcome evil by doing good. I pointed out that their behavior toward one another was not getting better, even though they were punished, but that it was growing worse. So, they would be required to serve one another when there was conflict, starting immediately. I said, Luke you will need to clean up Mark’s breakfast dishes for him. Mark, you will clean up Luke’s breakfast dishes. And you will kindly thank one another for your brother’s act of kindness toward you. A look of shock and disbelief came over their faces. Mark, my younger son, began to cry, asking me if he could just be sent to his room. Sadly, I saw that he would rather be punished than be good to his brother. Later in the morning, another conflict developed between the boys. I promptly had Luke take his brother’s school books upstairs to his room for him. Mark was to empty Luke’s bedroom trash. I reminded them that we will continue to overcome evil with as many good deeds as are necessary and that continual strife and bickering is a root problem of selfishness. All four of my children have become familiar with my assignment of good deeds in the midst of strife. I have found it to be the quickest remedy and one that is long lasting because it deals with the heart of the issue. I saw such a difference in the hearts of my children that I decided to take our training a step further. In addition to our training in good deeds, we have instigated a time to bless one another. Periodically at the dinner table, we will all (mom and dad included) exchange names. As you choose a name, you are to think of something admirable and honorable to share about the person whose name you chose. This exercise did take some training. There were to be no quick and easy compliments like I like your blue shirt. You must share something that is truly commendable about the other person’s character. The results were remarkable. Mark relayed an act of kindness that Luke had performed on his behalf and followed his comments with Luke is a good big brother. Luke’s face softened as words of affirmation rolled off his brother’s tongue and into his own heart. I recognized that by being required to verbally bless one another my children would have a mental catalog at their disposal. This catalog would contain a plethora of positive words attributed to them by their siblings. What better way to form good lifelong memories and encourage their God-ordained relationships with one another Sibling strife is not a thing of the past at the Miller household, but at least we know how to fight it effectively.